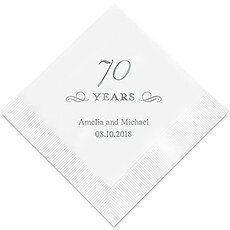 Anniversary, birthday, retirement, whatever the reason for the party, choose from our wide selection of personalized napkins to make it special. Are you having a party to celebrate a wedding anniversary, birthday, work anniversary or retirement? Our customized anniversary napkins add a touch of sophistication to the occasion, while giving guests and nice keepsake and keeping your budget low. Personalized birthday napkins are a great way to honor someone who has reached a milestone age, whether it's 20 or 90!Our milestone anniversary napkins are available from 5 years to 100 years, in 5-year increments. You can choose from quite a few napkin colors and imprint foil colors for truly personalized birthday or wedding anniversary napkins that will match your event decor. In addition to the milestone, you can print up to two lines of additional text, which can be the person's name and birth date or couple's first names and date of their wedding. That's typically what is printed, though you have free rein, so long as each line can fit within 25 characters!These anniversary napkins (personalized, cheap) are only cheap in price. They are premium paper napkins in beverage, luncheon and classic folded dinner sizes, with sumptuous foil-printed lettering, with many available designs, including romantic hearts, years and monograms. At The Knot Shop, we help create unique weddings, bridal showers, anniversary parties, birthday parties and many other kinds of celebrations, with our exquisite custom products. Other personalized birthday decorations include twisted stem champagne glasses, shot glasses, coffee mugs, coasters, stickers, party favor bags and gift tags.For more than 34 years, Weddingstar Inc., home of The Knot Shop, has been making wedding dreams come true. We carry a big selection of colorful decor for wedding receptions, anniversary parties, birthday parties, bridal showers and other special occasions, with many unique, personalized products.